“A bright idea came into Alice’s head. ‘Is that the reason so many tea-things are put out here?’ she asked. 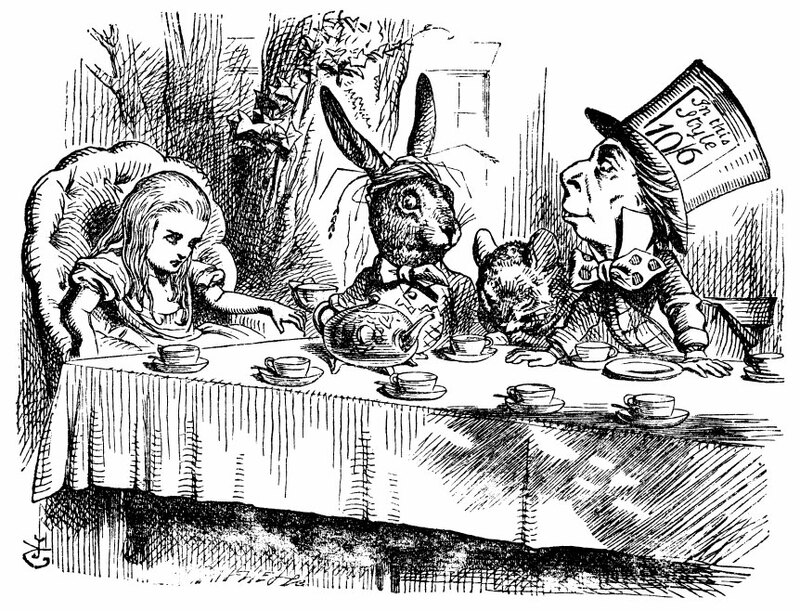 If you could cordially invite six authors (3 males, 3 females- living or dead) to a tea party- who would they be? 1. Agatha Christie- Not only did she write over 80 novels and therein create the über-sharp Miss Marple and brilliant Hercule Poirot (Belgium. Warning: Never call him French), but she was a nurse during the second World War, and later traveled around the world from England to Australia to Egypt. The true stories she could regale us with! 3. Anne Bronte- Of course, a Bronte must be invited to my party. Why not Emily or Charlotte? Well, let’s face it. Emily would just turn down the invitation, and spend the day roaming through her moors. Charlotte would be fun, but she left us many letters. Anne, however, has been quieted throughout the centuries. But it’s obvious in her novels, Agnes Grey and Tenant of Wildfell Hall that she was very perceptive of human nature with much to say. I’d want to meet the oft- forgotten sister. 4. Edgar Allen Poe- To him recite The Raven, The Conqueror Worm, and Annabel Lee. To listen to how he came up with his ideas for The Tell-tale Heart, Ligeia, and more. And most of all, to let the man know who died penniless and alone, how beloved and respected his work is today. 5. Daphne Du Maurier- When she wasn’t spinning incredible gothic romance tales such as Rebecca and Jamaicca Inn, she was penning chilling tales such as The Birds and Don’t Look Now. I’d love to hear her insights on plot and narrative structure. 6. Sir Arthur Conan Doyle- Creator of Sherlock Holmes. That’s reason enough. But he was also part of the 19th century Spiritualist movement and it would be so much fun to hear first hand accounts of seances he attended. So, who is cordially invited to your tea party?